I also know it's made by TOBLER chocolate company as they're first product. 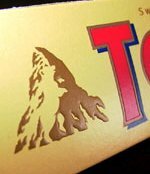 As such it was called TOBLER ONE, but the boss misread the hand writing and pronouced it TOBLERONE by a mistake! Not according to their website! But they might be making up lies to make it seem less like a mistake! Oh no! I better leave the counrty and go into hiding! Luckly i have a flight to Canada booked for the end of the month, so i can lay low there for a while!